Long, tasty fruit for growing outside. Very prolific. 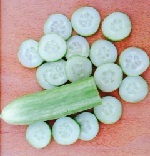 Half-size variety with a very thin skin and crunchy, sweet taste. Very productive, all female. Traditional, long variety with good resistances. Very good in unheated greenhouse or polytunnel. Like all cucumbers it should not be allowed to get too big. We found around 1ft long was perfect. All female variety producing a high yield of good tasting, long, dark green bitter-free fruit. Very early to crop. Good resistance to powdery mildew. Replaces Cucino which is no longer available. To be picked when really small - 4-5" (10-12cm) long! All female.